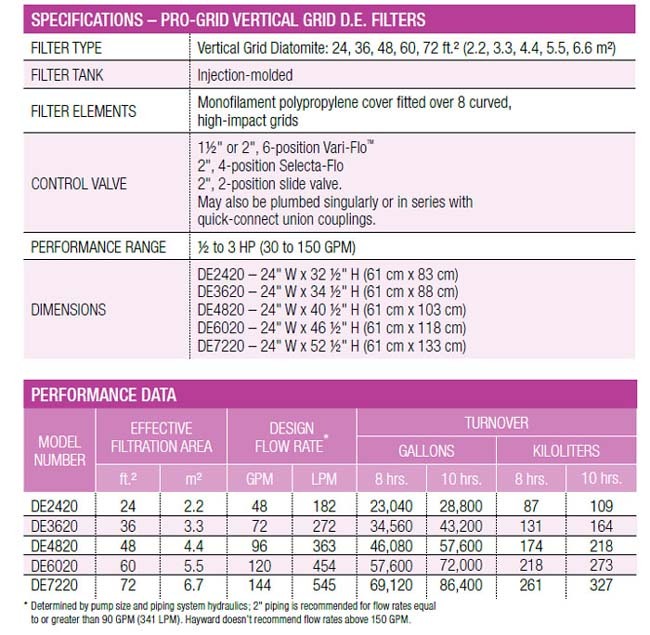 Hayward Pro-Grid vertical grid D.E. filters provide superior water clarity, efficient flow and large cleaning capacity for pools and spas of all types and sizes. Constructed with high-strength reinforced thermoplastic, Pro-Grid combines high-technology features and service-ease design for an unparalleled filtration value for both new pool and aftermarket installations. In addition, Pro-Grid delivers low maintenance and dependable operation. Reinforced thermoplastic filter tanks constructed from durable glass reinforced copolymer to meet the demands of the toughest applications and environmental conditions, including in-floor cleaning systems. Self-Aligned tank top and bottom make access to servicing the grid elements fast and simple. Heavy-duty, tamper-proof one-piece flange clamp securely fastens tank top and bottom, allowing for quick access to all internal components without disturbing piping or connections. High impact grid elements designed for up-flow filtration and top-down backwashing for maximum efficiency. Integral lift handles and uniform low-profile base make removal of grid nest fast and simple. Inlet diffuser elbow distributes flow of unfiltered water evenly to all filter elements and provides even distribution of D.E. to grids. Allows for both commercial and large residential applications and years of non-corrosive, trouble-free performance. It's always best to go a little larger on the filter than a little smaller. You can't have too much filtration. Diatomaceous earth (D.E.) is mined and is the fossilized exoskeletons of tiny diatoms. They are used to coat grids in the filter housing and act as tiny sieves allowing for the removal of debris as small as 5 microns. Once the pressure rises, the filter is backwashed just like a sand filter and then "recharged" with more D.E. powder. D.E. filters trap debris as small as 2 - 5 microns. 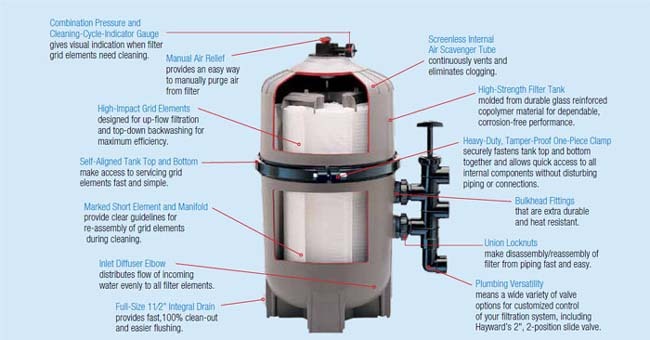 Please Note: DE7220 - Hayward Pro Grid DE Filter will ship by common carrier trucking. Shipping is still FREE but may take slightly longer for delivery. Click the button below to add the Hayward Pro Grid DE Filter - Inground Pools to your wish list.